Wonderful villa with sea view 20 m from the beach. Holiday villa located in a residential area called Residence Capo San Giorgio in the locality of Timpi Russi, a few km from Sciacca, Ribera and Agrigento. Immersed in a garden dominated by typical plants of the Mediterranean, the house is simple and with essential furniture to spend a holiday of relaxation and tranquility. A beautiful view of the sea predominates from every point outside the house, and in the barbecue area you can enjoy wonderful outdoor grilling. Just 50 meters away on foot, in a small bay, there is a sandy and pebble beach. Possibility of visits and excursions in the nearby Selinunte only 30 km, Eraclea Minoa 35 km, Agrigento 65 km, Erice 100 km. On request, when booking, you can join the two single beds and make a double bed. 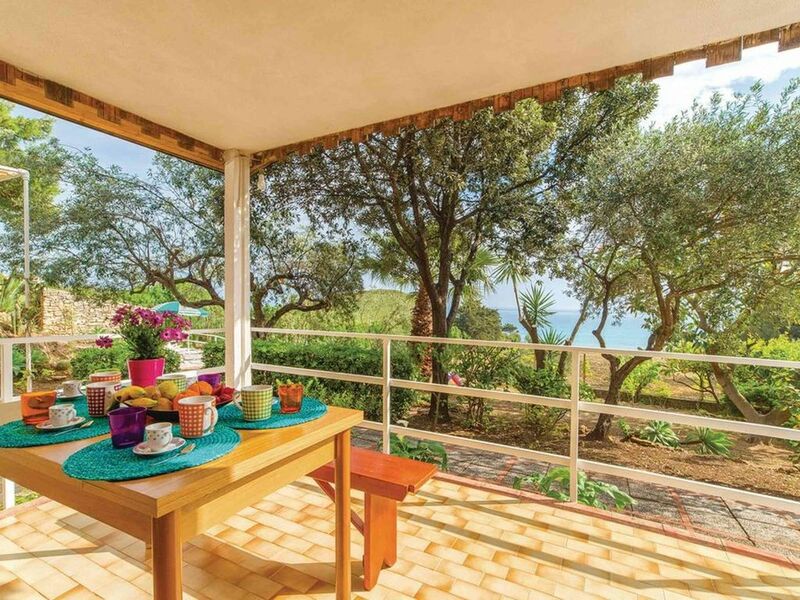 Holiday Home Sciacca is a villa located on a slight hill with a wonderful view of the sea. Totally surrounded by greenery, it offers various relaxation areas for adults and children. The sea is accessed from our private road and from a comfortable staircase. The sandy beach is fantastic, with shallow water. The views are breathtaking, and being able to reach the beach along a few meters is something exclusive. Guests have access to the 1200 m2 outdoor area, full of typical trees and plants. The Barbecue area is definitely a strong point of the structure. The sea view makes the villa unique. My name is Maria, I am a chemist and I dedicate myself to teaching. I particularly want to welcome guests in the best way, making the house in perfect order and cleanliness. Proximity to the sea, raised position that allows a wonderful view, quiet and residential area. The villa is 6 km from the center of Sciacca. On site you can: - rent beach towels of your choice at a cost of 5 euros per towel. In the case of long stays you can request: - a house cleaning at a cost of 50 euros - a change of towels for a cost of 7 euros per person. The Villa is located in a residential area, very quiet. The proximity to the sea makes it unique, on foot you can reach the beach which is about 20 m. The position of the Villa makes it unique because from the veranda of the house you can make breakfasts, lunches and dinners with a wonderful and evocative sea view. Ideal for families with children, as the area surrounding the villa 1200m2 of garden containing various outdoor games allows children to spend moments of fun in contact with nature. 6 km from Sciacca, a wonderful tourist city you will find every service, from supermarkets, restaurants, shops, cinema.